Verona Chard Cockney Show members are dressed as Pearly Kings and Queens and offer traditional cockney entertainment. Sing-a-long audience participation a must! 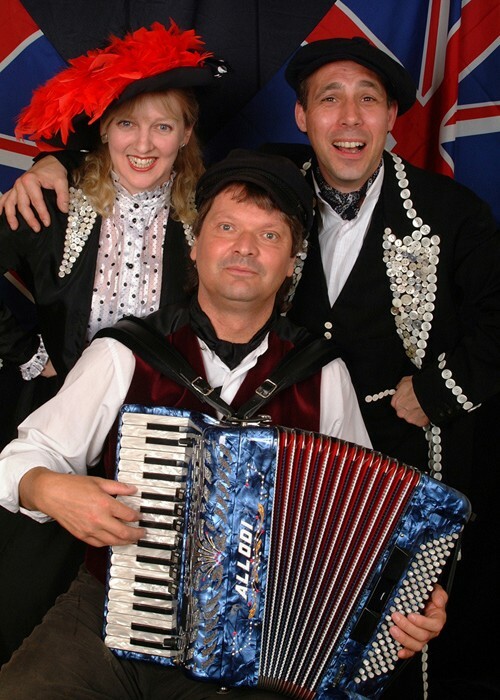 Verona Chard has been an exponent of theatre and music for over twenty-five years and has performed in many concerts and for corporate events, parties, weddings and private functions both in the UK and Internationally. Theatre includes Sidmouth Repertory and No 1 tours of David Copperfield, Jane Eyre and These Foolish Things plus umpteen pantomimes and many fringe first performances at prestigious venues such as The King’s Head. Solo singing engagements include The South Bank and major music society events plus broadcasts for the BBC, Thames, ITV, HTV etc and on local and National radio including Classic FM. Verona has also performed at many top festivals such as Bath, Edinburgh and Brighton. Verona trained at the Royal Academy of Music and Trinity College and is a member of Equity and Musicians Union, she is the vocal tutor at The Method Studio, London. She is Director of The Seahorse Theatre Company, co-director and sponsor of the Norwich Forum Street Theatre project, Director of The Vamp Organisation Ltd and a Management Committee member of The Ealing Chamber of Commerce.